Browse the complete collection of If You Give… printable activities, coloring sheets, craft pages, and recipes! 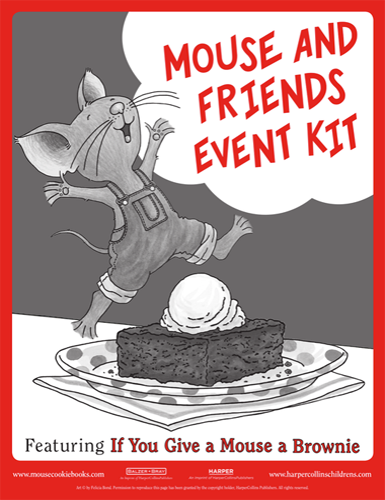 Celebrate If You Give a Mouse a Brownie with this new activity booklet featuring activities based on all of the beloved If You Give… characters. 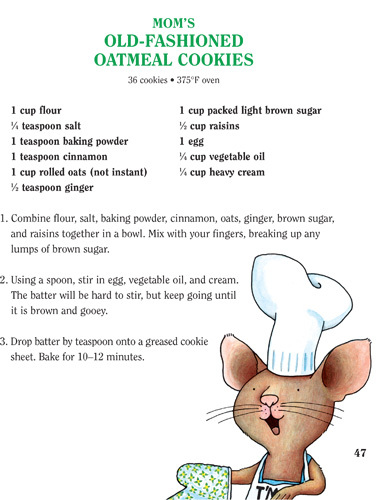 Make a batch of delicious oatmeal cookies with Mouse! 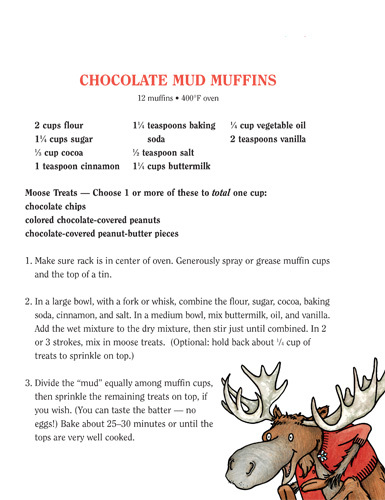 Make a batch of delicious muffins with Moose! 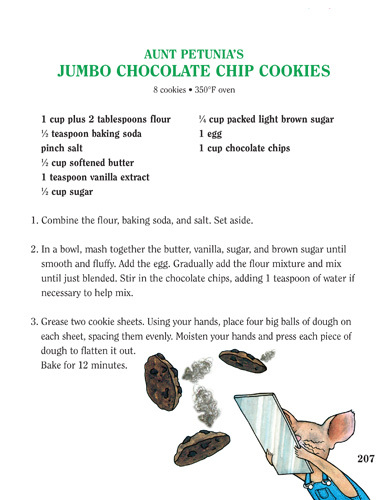 Make a batch of delicious chocolate chip cookies with Mouse! Celebrate 30 years of giving with our downloadable event kit! Host the perfect party with our downloadable event kit! Help Cat find his way through the maze to get to the cupcake at the end. Try not to get caught up in his adventures along the way! When Cat was looking for seashells at the beach, he found some other things as well. Can you spot the hidden objects in the picture? What is Cat doing? Connect the dots to find out and then color in the picture. Cat is very active and likes to have fun. Look carefully at the pictures below and circle the one that is different in each row. Make the Match with Cat! Draw a line to connect each word on the left with the matching picture on the right. Bring the backyard fun of IF YOU GIVE A DOG A DONUT indoors by searching for the words hidden in the puzzle. The words can appear horizontally, vertically, diagonally, forward, or backward. Draw a line to connect each picture on the left with the matching word on the right. Help Dog find his way to the center hole of the donut maze, where some apple juice is waiting for him. Because, as you know, if you give a dog a donut, he’ll need some apple juice to go with it! Cut out the sixteen cards below. Spread the cards out facedown. With a friend, take turns flipping two cards over, trying to match the picture. See how many matches you can make! Cut and color your own donut with this printable crafting activity. Connect the dots below to discover which animal friend enjoys donuts and apples! If you give a dog a donut, he’s going to ask for a glass of milk. What is your favorite food? And what goes with it? Create your very own story by filling in the blanks below. Then draw a picture to go with it! If you give a mouse a cookie, the adventure won’t stop there! After reading If You Give a Mouse a Cookie, fill in the missing letters for the words using the picture clues. Share all the fun of the If You Give… series with your students! Can you find the supplies that Mouse should keep in his backpack and bring to school? Help Mouse Count His Ornaments! Mouse is decorating his Christmas tree and needs your help. Count the ornaments you see in each circle below and fill in the missing number in each sentence. Get your crayons and markers ready! Make Moose extra colorful with this printable coloring page. Connect the dots below to discover which animal friend enjoys muffins and jam! Pig loves pancakes. Draw pancakes on Pig’s plate, as many as you’d like. Count them up and see how many pancakes Pig will eat! Get your crayons and markers ready! Make Pig extra colorful with this printable coloring page. Help Pig Get to the Pancakes! Pig is hungry for pancakes, can you help her through the maze? Get your crayons and markers ready! Make Mouse extra colorful with this printable coloring page. Mouse is hiding in 5 different places in this picture. Circle each mouse that you find! Circle the items that DO NOT belong in the backpack. Draw a line to connect each picture on the left with the matching picture on the right. Decorate a cake for Pig and her friends. Add candles, flowers, sprinkles, and more!